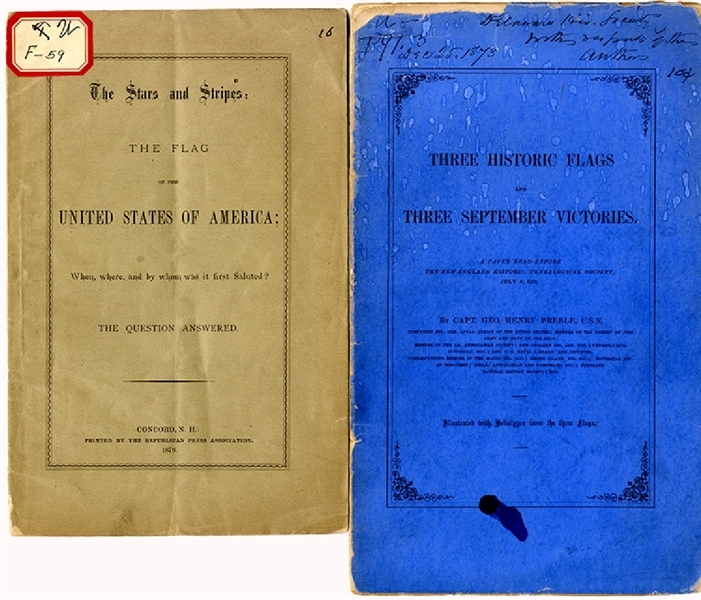 to include; Three Historic Flags and Three September Victories” 1873, Captain George Henry Preble, USN, 32pp., plus cover, 6” x 10”, limited edition of 100, exlibrary, cover chiped and loose. The booklet present heliotypes of Flag of the Bon. Homme Richard, September 23, 1779, Flag of U.S. Enterprise, September 5, 1813 and Flag of Ft McHenry, September 14, 1814. ... plus, “The Stars and Stripes: The Flag of the United States of America; When, where and by whom was it first Saluted? The Question answered.” 6” x 9”, 1876, Concord, exlibrary, 28pp. VG.